AVR® Fuses are the locations in non-volatile memory that define the hardware configuration of an AVR device. Fuses are placed in a select section of memory and consist of a few registers. Each bit of the register represents a different fuse setting. Detailed information on which fuses are available in the different programming modes and their functions can be found in the device datasheet. Instruction clock speed, watchdog timer and debug mode are just a few of the fuse settings available on most devices. 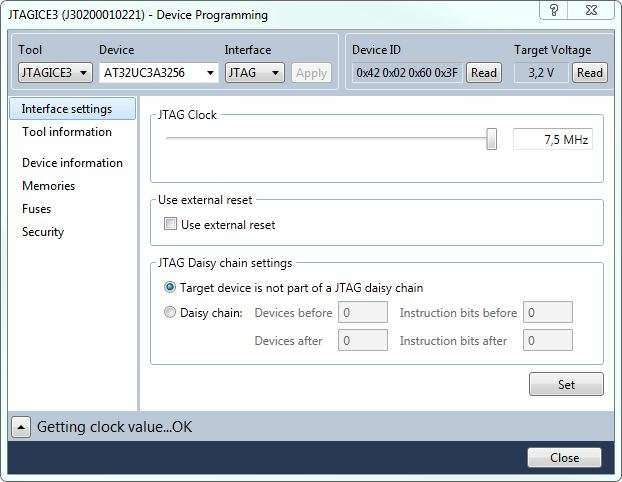 Fuses are changed at programming time with a connected programmer such as the ICE Debugger/Programmer using Atmel Studio 7 IDE. They are latched in place after programming and also at power-up of the device. Unless careful consideration is made of which Fuse bits are programmed, it is easy for the novice programmer to brick their device (i.e. 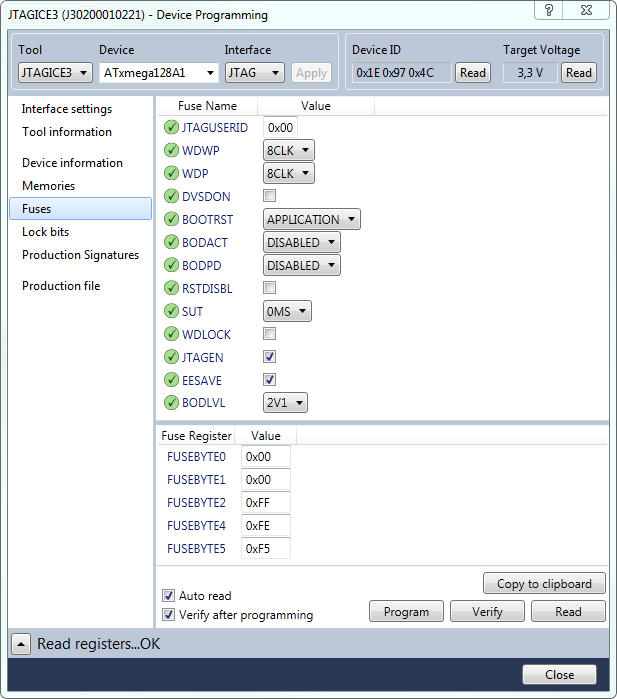 render the MCU un-programmable/un-debuggable in his/her application circuit). 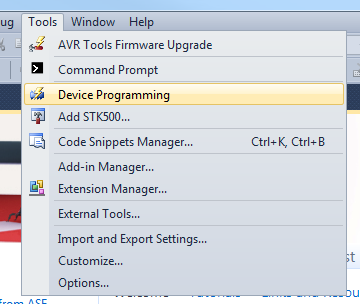 The Device Programming window (also known as the programming dialog), gives you the most low-level control over the debugging and programming tools. With it, you can program the device's different memories, fuses and lock bits, erase memories, and write user signatures. It can also adjust some of the starter kit properties such as voltage and clock generators. The programming dialog is accessible from the Device Programming Icon on the standard toolbar or in the Tools→Device Programming drop-down menu selection. The Programming Window will appear with various programming options listed on the left. Select the Fuses option and the fuses page will appear showing the fuses of the selected device. Fuse settings are presented as check boxes or as drop down lists. The Fuse register settings also appear in the lower pane as hexadecimal values. Press the Read button, in the lower right corner, to read the current value of the fuses. If the Auto read box is checked, the fuse settings will be read from the device each time you enter the fuse page. From the drop down boxes the fuse settings can be changed. Some selections require a box to be checked or unchecked. Note - A fuse bit that is selected is set to a "0" in the register. After any changes are made to the settings, press the Program button to write the current fuse setting to the device. If the Verify after programming box is checked, the settings will be verified after a programming operation is completed. The fuse values are latched when the device enters programming mode and changes of the fuse values will have no effect until the part leaves Programming mode. This does not apply to the EESAVE Fuse which will take effect once it is programmed. The fuses are also latched on Power-Up in Normal mode. Help! I've Bricked my MCU!